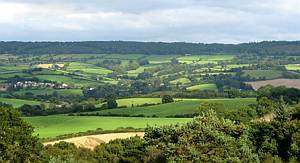 Countryside Survey 2007 estimated that there are 402,000km of â€˜managedâ€™ hedgerow in England. A managed hedgerow is a line of woody vegetation that has been subject to management so that trees no longer take their natural shape. There are a further 145,000km of linear features such as relict hedges and lines of trees. Between 1998 and 2007 6.1% (26,000km) length of managed hedgerow decreased â€“ a large proportion of these managed hedges turning into lines of trees and relict hedges (which increased by 13.2%), reflecting a reduction in management intensity. Regularly managed, stock proof hedges have declined in England from 1984 through to 2007, but with a period of no change between 1990 and 1998. From 1990 onwards the decrease in managed hedgerows has been predominantly through the lack of management leading to conversion to lines of trees/shrubs and relict hedges rather than hedgerow removal. The types of woody linear features that increased were clearly those which were less managed, in particular relict hedges and lines of trees/shrubs. A set of criteria to define â€˜favourable conditionâ€™ was developed by the Steering Group for the UK BAP for Hedgerows (the pre-cursor group to Hedgelink) which aim to reflect the key management factors affecting hedgerows. These are based on several attributes each of which have been assigned thresholds to indicate whether a particular hedgerow is in favourable condition or not. These attributes are listed below. In 2004 the applicability of the method was tested in the field by Catherine Bickmore Associates (25% of the case study hedges (116) passed all of the attributes (note this was not a statistical sample). Today hedgerows are highly valued by people, and for many reasons. In the past they were considered essential for marking ownership boundaries, and for keeping livestock in or out of fields. Although hedgerows remain vitally important for agriculture, these particular reasons for keeping hedges are less valid now, with the easy availability of accurate maps, GPS and wire fencing. However, there are additional, new, strong, justifications for looking after hedgerows and for planting more. These new reasons recognise the importance of hedgerows as part of our cultural heritage and historical record, and for their great value to wildlife and the landscape. Increasingly, they are valued too for the major role they have to play in preventing soil loss and reducing pollution, and for their potential to regulate water supply and to reduce flooding. Hedgerows may even have a role to play in taking greenhouse gases out of circulation through carbon storage, if they are allowed to expand in size. Certainly any loss exacerbates climate change to some extent. There were two other major uses for hedgerows in times past, and those were as a source of firewood, and for providing shelter from wind, rain and sun for crops, farm animals and people. With fossil fuels becoming scarce and expensive, and the threat of more frequent and more violent storms, both these uses may soon once again come to prominence. Other uses of hedgerows today include screening unsightly development, providing privacy to homes, and as a source of berries for jams and material for various crafts like walking stick making. Cattle, sheep and other livestock will often search out particular leaves and flowers from hedgerows to supplement their diet or to self-treat ailments – for example, ingestion of coarsely hairy plants like hogweed scours parasitic worms from the intestine. This document (PDF 200k) provides a useful summary of the ecosystem services provided by hedgerows. The UK is rightly known throughout the world for its rich and varied patterns of hedgerows, a part of our cultural and landscape heritage which ranks alongside great cathedrals, quaint villages and spectacular coastlines. There is a popular belief that most hedgerows are recent additions to the countryside, having been planted across an open landscape under the Enclosure Acts of the early 19th Century. In fact, at least half our hedges are older than this, and many are hundreds, some even thousands, of years old. In Devon for example, we believe that over a quarter of our hedges are more than 800 years old – that’s older than many parish churches – and some are underlain by banks built in Bronze Age times four thousand years ago. Others are older still, being remnants of the original wildwood that covered Britain and Ireland before man started to carve out his fields. So, a great many of our hedgerows are ancient and of historical interest in their own right. This is particularly true where they mark parish boundaries, ancient monuments or other such features. Often beautiful old veteran trees, their lives prolonged by repeated pollarding over the years, reveal the great age of hedgerows and their importance to our ancestors. We also have a rich tradition of different hedgerow management techniques, particularly of hedge laying, and this too is an important part of our cultural heritage, one which helps to give both a sense of continuity and one of place to local communities. - Oliver Rackham. The History of the Countryside. 1986. Dent and Sons, London. The networks of hedgerows, and in some places dry stone walls, that cover so much of our countryside pick out changes in topography, soils and underlying geology, and define current, and often past, patterns of agriculture and other land use. Together with woods, roads and settlements, they give character to the landscape and impart much local distinctiveness. Just imagine a countryside without hedgerows. How featureless and bland it would be! For information about the importance of hedgerows to the landscape in your area, see Natural England’s Joint Character Areas article. Hedgerows are very important for wildlife in their own right, and now that consist predominantly of native trees and shrubs are recognised as a priority habitat for conservation action within Englands Biodiversity 2020 targets. As a mixture of woodland, scrub and grassland, hedgerows contain a wealth of different plant and animal species, and across large swathes of the countryside are an essential habitat and refuge for the majority of our farmland wildlife. Hedgerows are also important for a large number of threatened or rare species. These include plants like the Plymouth pear, insects like the brown hairstreak butterfly, birds like the cirl bunting and mammals like the dormouse. The very high importance of hedgerows for birds is clear from the following facts. No less than 21 priority BAP bird species are associated with hedgerows, and for 13 of these, hedgerows are a primary habitat. Similarly, as many as 16 out of the 19 birds used by Government to assess the state of farmland wildlife are associated with hedgerows, with 10 using them as a primary habitat. For further information see our Importance of hedges for birds Excel file. For further information on the wildlife of hedgerows, see our wildlife and hedgerows page. The considerable value of hedgerows in helping to conserve essential natural resources such as soil and water, and in helping to prevent pollution, has been long recognised over much of the rest of Europe. Only recently in the UK are we too coming to appreciate the highly significant role they can play in these respects, in part because of increasing concerns over climate change. Hedgerows can be very effective at preventing loss of soil from fields, either through reducing wind erosion or through acting as a barrier to water-borne run-off. This is particularly so in arable areas, both where the land is flat and prone to wind-blow as in the Fens of East Anglia, and in hilly areas where loss of soil following heavy rain can be a major problem especially in places prone to gully erosion. Hedgerows also play a valuable role in reducing the amount of polluting fertilisers, pesticides and sediment that reach watercourses, through acting as a physical barrier, through increasing infiltration into the ground, and through being recycled by the trees, shrubs and other plants. For this reason they are often planted along contours above ditches, streams and rivers. Hedgerows can be very effective at regulating water supply for crops, in several ways. Firstly, through decreasing wind speed over the ground surface, hedgerows reduce water loss through evaporation in areas prone to drought. As an example, it is for this reason that a network of hedges of has been planted in the Rhone valley in France. Secondly, hedges can help to store water for later use. Thus a 1ha field with a 50m hedgerow at the bottom can store between 150 and 375 cubic metres of water during rainy periods for slow release down slope, during dry periods. This effect is greatest in soils rich in clay or organic matter. Thirdly, because of their deep roots, hedgerows remove water faster from the soil than crops during periods of excessive rainfall, through increased evapotranspiration. Together with woods, hedges reduce the rate of flow of water within catchments, so help to reduce flooding downstream. A comparison between two very similar catchments in Brittany, one with hedges and the other without, showed that peak flows in streams are less extreme and minimum flows greater in the hedged areas. Across the UK, hedges were not long ago essential sources of wood for cooking and heating, and were managed accordingly. The use of cloam ovens powered by faggots taken from hedgerows was still commonplace in rural parts of Devon in the first part of the 20th Century. Unlike today, when a hedge was layed or coppiced little was wasted. Now, nearly everything, even larger timber, is burnt in bonfires on site, and the energy and nutrients wasted. With concerns over climate chaos resulting from global warming, and driven by increasing oil and gas prices, more interest has been shown recently in harvesting the material taken from hedgerows when they are cut, layed or coppiced, for use in heating. The wood can either be used directly in log-burning stoves, or chipped for use in biomass burners and boilers. Members of Hedgelink would be very interested to hear from anyone developing the technology to harvest the material generated from flail cutters. A case study on the economics of harvesting wood for heating fuel from hedgerows. For a single layed hedge in Devon, this case study shows that it was highly economic to extract the wood for use in wood stoves, provided the hedges was going to be layed anyhow. The study also shows that the fuel taken from the hedges was a highly sustainable green source of energy. Download the Fuel from hedgerows case study (.doc 114 KB). Below are key points from a document about the importance of hedgerows and the services they provide to society. The importance of hedgerows and the services they provide to society. This text has been produced by Hedgelink to assist those making the case for improving hedgerow policy, resources or protection, through the provision of key points and facts. It is not designed to be used directly, without interpretation or being tailored to the specific context. Contact Hedgelink for information on the key issues currently surrounding hedgerows. You can also download the full document in Word format (63 KB). Hedgerows and their associated trees, banks, ditches and margins provide a wide range of valuable services which benefit people. They include not only biodiversity services, but also regulating services such as pest control and flood control, cultural services such as landscape aesthetics and historical heritage, and provisioning services such as the firewood and food. A review of the services provided by Environmental Stewardship in England has revealed that hedgerow options provide a greater number of services, 21 in all, that any other group of options. Hedgerows are the most widespread semi-natural habitat in England, Wales and Northern Ireland. Over large parts of the lowlands they are the main surviving semi-natural habitat, and are critical to the existence of numerous plants and animals. They are particularly important within areas of intensive farming, and for the survival of widespread yet declining species which are dependent on woodland edge, scrub or rough grassland habitats. Hedgerows facilitate movement through the landscape for a wide range of organisms. They are particularly important for flying insects like butterflies which need warm sheltered conditions to be able to gain, and retain, the heat necessary to fly. Green lanes, typically two hedgerows in parallel separated by a vegetated track, provide particularly favourable conditions. Overall, the length of hedgerow in GB has remained stable over the last decade. However during this period there has been a 7% decline in the number of classic shrubby hedgerows and a 9% increase in the number of hedgerows that have developed into lines of trees or relict features. This is having a significant impact on the landscape and reflects lack of appropriate management. Most of the UK’s hedgerows are in poor condition, reducing their ability to deliver environmental services and putting their dependent wildlife at risk. Local hedgerow surveys suggest that only 41% of hedges are in favourable condition even without taking nutrient enrichment into account, and the true figure is likely to be lower than this. Nutrient enrichment is the single most important reason for poor condition, 38% failing on this criterion. The other main reasons for poor condition are excessive gaps and hedgerows being too low or too thin. Over 125 priority BAP species are closely associated with hedgerows, 11% of all such species . Although very few are wholly dependent on hedgerows, the loss of hedgerows or a decline in their quality will have a significant adverse impact on their populations. A high proportion of these BAP species are widespread within the UK but have been recognised as priorities for conservation action because their populations have declined rapidly in recent decades. For example, 51 out of the 71 widespread and common moths listed as priority BAP species because they have declined hugely in recent decades feed as caterpillars in hedgerows and their associated herbaceous margins. This confirms the importance of hedgerows for wildlife as a whole, not just for rare species. Hedgerows are of particular importance for the conservation of farmland and woodland birds, and for mammals. As many as 16 out of the 19 birds included in the Farmland Bird Index, as used by Government to assess the state of farmland wildlife, are associated with hedgerows, with 10 using them as a primary habitat. All 35 woodland indicator species frequently occur in hedgerows or their trees. In addition, 10 out of 18 terrestrial mammals listed as priority species in the UK BAP make significant use of hedgerows, for food or to enable them to move through the landscape. Rare or threatened species closely associated with hedgerows include several European Protected Species, notably dormouse, most species of bat including the greater horseshoe bat, and great-crested newt. These species require well connected networks of hedgerows, rather than individual hedgerows, emphasising the importance of hedgerows at a landscape scale for biodiversity. A wide range of other threatened species are dependent on hedgerows, including a few that are very rare and specially-protected such as round-leaved feather-moss, starved wood-sedge, Plymouth pear and barberry carpet moth. Other species of particular conservation concern closely associated with hedgerows include five species of uncommon and rapidly declining bumble bee, two scarce butterflies, the brown and white letter hairstreaks, the rare cirl bunting and the declining turtle dove. Much of the biodiversity of hedgerows is associated with hedgerow trees, in particular with veteran individuals. Over half (55%) of the priority BAP species associated with hedgerows are dependent on, or partially dependent on, hedgerow trees . The presence of hedgerow trees in areas targeted by agri-environment schemes increased the numbers of larger moth present by 60% and the diversity of such moths by 38%. The scarcity of young hedgerow trees to replace mature ones when they die is a major cause of concern: across Great Britain, the number of isolated hedgerow trees fell by as much as 3.9% just between 1997 and 2007. A further 15,000 -20,000 new hedgerow trees need to be recruited to the population each year just to keep the population stable. Hedgerows prevent loss of soil from fields, either through reducing wind erosion or through acting as a barrier to water-borne run-off. This is particularly so in arable areas, both where the land is flat and prone to wind-blow as in the Fens of East Anglia, and in hilly areas where loss of soil following heavy rain can be a major problem. 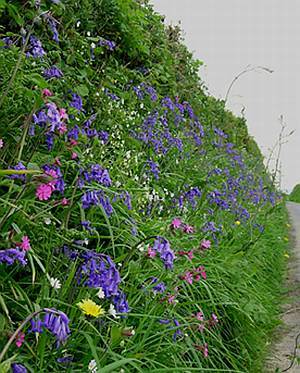 Hedgerows reduce the amount of polluting fertilisers, pesticides and sediment that reach watercourses through acting as a physical barrier, through increasing infiltration into the ground, and through nutrients being recycled by the trees, shrubs and other plants. Hedgerows regulate water supply for crops in three ways. Firstly, they decrease wind speed over the ground surface, so reducing water loss through evaporation in areas prone to drought. Secondly, hedgerows can help to store water for later use – a 50m hedgerow at the bottom of a 1ha field can store between 150 and 375 cubic metres of water during rainy periods for slow release down slope during dry periods. This effect is greatest in soils rich in clay or organic matter. Thirdly, because of their deep roots, hedgerows remove water faster from the soil than crops during periods of excessive rainfall, through increased evapotranspiration. Hedgerows regulate the rate of flow of water within catchments, reducing peak flows and increasing minimum flows. They are thus are effective at reducing the risk of flooding and are increasingly planted for this purpose. Hedgerows may play a significant role in reducing the rate of climate change, through carbon storage, and through the provision of firewood, a renewable fuel. A new hedgerow may store 600 – 800 kg of CO2 equivalent per year per km, for up to 20 years. In urban areas hedgerows contribute to services such as climate regulation, sustainable urban drainage, reducing airborne particulates and atmospheric pollution, and providing wildlife habitat. They also improve the aesthetic appearance of the built environment. Hedgerows are a defining feature of the landscape, creating the characteristic structure and pattern of the landscape. In Northern Ireland they form 60% of the broadleaved cover (David Gillespie, DARDNI). There are many local variations, with distinctive ecological and cultural associations. Aesthetically, hedgerows provide pattern, local grain and texture in the landscape. 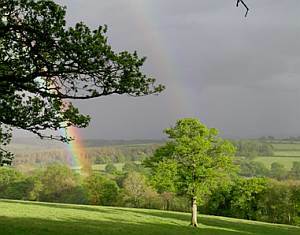 Nearly all mature trees in rural areas outside woods and gardens have their origins in hedgerows, including in-field trees. It has been estimated that there are between 20 and 50 million hedgerow and field trees in England, covering very roughly 2.5% of the land area. Consequently, they have a profound impact on the landscape. The loss of mature elms graphically illustrated this. Hedgerows can shield unsightly development and protect privacy. Two thirds of England has had a continuously hedged landscape for a thousand years or more. Some hedgerow systems date back to prehistoric times, and most were well established by the Anglo-Saxon period. It is only in the Midlands and part of the North-East that the majority of these early hedgerows were removed in Medieval times to create open field systems, and new hedgerows subsequently planted under the Enclosure Acts between 1750 and 1850. Consequently, many of England’s hedgerows (and probably those in Wales and Northern Ireland) are a thousand or more years old, and most predate the Enclosure Acts. They are thus older than many of the historic buildings, like parish churches, that society values highly. Hedgerows, through their rich and often intricate patterns, tell the story of the countryside and farming traditions over many centuries. Their loss removes much of the cultural and historical patina from the landscape, leaving it a blank canvas. Hedgerows have traditionally been the source of some iconic British foods and drinks, such as blackberry jam and sloe gin. 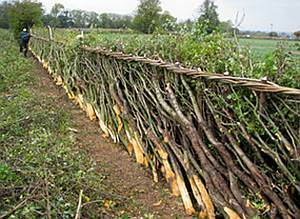 Hedgerows are being increasingly valued as a source of wood fuel, primarily for domestic heating. Wood Chips from Hedgerows: a Potential for On-Farm Mulching and Bioenergy?